The Wargames Illustrated Painting Competition 2019 located in the George Stephenson hall. There is no entry fee to the competition - just bring your painted miniatures along to the Wargames Illustrated stand located in the George Stephenson Hall. Entries	will	be	accepted	from	opening	until	12pm	(noon). 1. Historical Single Miniature. A single figure, foot or mounted, for any historical period. 2. Historical Unit/War Machine. Any unit of 3 or more models (foot or mounted) or a single vehicle or war machine with crew, for any historical period. 3. Fantasy Single Miniature. A single figure, foot or mounted, for non-historical genres including fantasy and steampunk. 4. Fantasy Unit/War Machine. Any unit of 3 or more models or a single vehicle, or war machine with crew, for nonhistorical genres including fantasy and steampunk. 5. Sci-Fi Single Miniature. A single figure, foot or mounted, for non-historical genres including science fiction, Weird War, and post-apocalyptic. 6. Sci-Fi Unit/War Machine. Any unit of 3 or more models or a single vehicle or a war machine with crew, for nonhistorical genres including science fiction, Weird War, and post-apocalyptic. 7. Youth Category. A single figure, foot or mounted, any period or genre, for painters 16 and younger. 8. Open Category. Any model, vignette, or diorama of any scale, up to 8" x 8" x 8", any period or genre. 9. Kallistra – Historical/Fantasy. 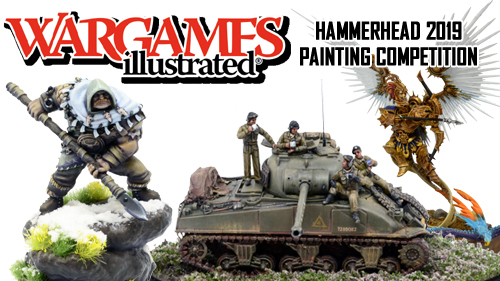 Any unit of 12mm figures manufactured by Kallistra – the hosts of Hammerhead.